Urbanization is a driver of both economic growth and global climate change. Between 2011 and 2030, the urban areas of the world are expected to add 1.4 billion people, including 276 million in China and 218 million in India. Photo by Ken Marshall/Flickr. No strategy for reducing the impacts of global climate change is complete without addressing the challenge of urbanization. Cities contribute about 70% of energy-related greenhouse gas (GHG) emissions, despite only accounting for 2% of global land area. Reducing this environmental impact may seem daunting, but a new report, Better Growth, Better Climate, finds that there are several actions city leaders can take that can reduce emissions while driving economic growth. The report finds that connected, compact cities could save $3 trillion in infrastructure investments over the next 15 years. Not only that, but they can also curb global climate change and yield immediate local benefits for air quality, health, and quality of life. Urbanization is occurring at an unprecedented scale and pace, with about 60% of the global population expected to live in cities by 2030. It took 150 years for the urbanization rate in European countries to go from 10% to 50%, but we’ve now seen the same shift take place in one-third of the time in many Asian countries. Unfortunately, the dominant paradigm in urban growth – characterized by unstructured expansion, sprawl, and increasing dependence on cars – is no longer affordable environmentally or economically. 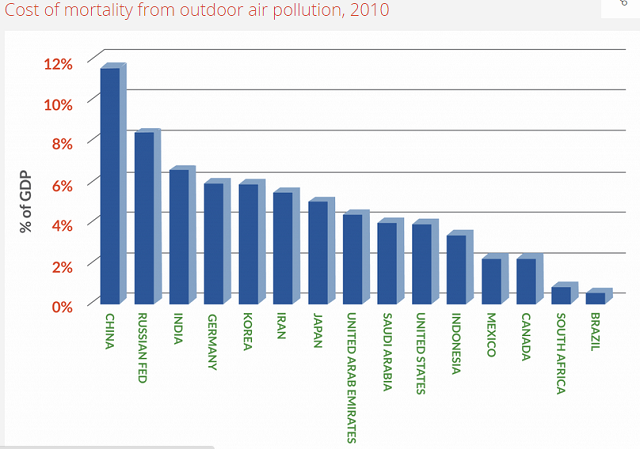 Of particular concern is the issue of urban air quality, which is projected to become the top environmental cause of premature mortality by 2050. In the 15 countries with the highest greenhouse gas emissions, the damage to health from poor air quality is valued at an average of about 4% of GDP. Cities in emerging economies suffer even more: Bangalore has witnessed an average 34% increase in air pollutants between 2002 and 2010. In Beijing, a recent estimate suggests that heavy haze in the month of January 2013 alone caused RMB 23 billion (USD 3.7 billion) in economic losses, about 98% of which were health-related costs. Another study indicates that the total social cost of air pollution and congestion from motorized transport in Beijing lies between 7.5 and 15% of the city’s GDP, well above the global average. Graphic via Better Growth, Better Climate. 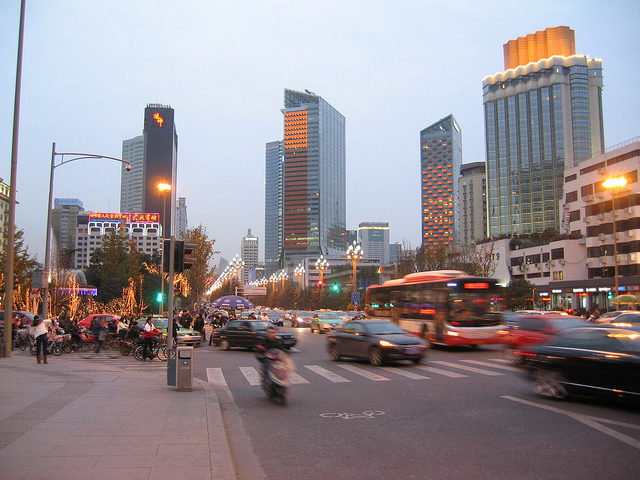 Urban sprawl and the resulting prevalence of private vehicle use are considered major contributors to both local air pollution and greenhouse gas emissions. 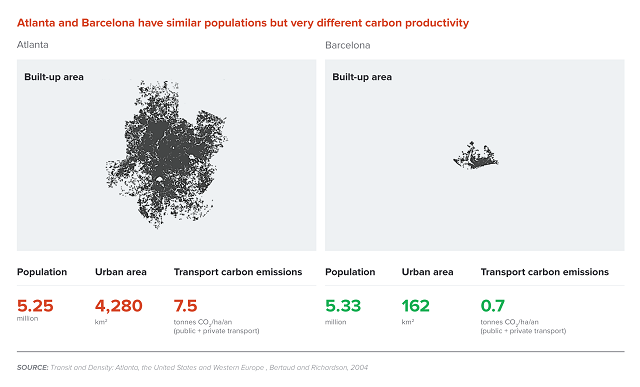 For instance, Atlanta emits roughly 10 times as much carbon from transport than Barcelona, even though the two cities are similar in population and income levels. The difference lies in Atlanta’s much larger urban footprint – 4,280 square kilometers compared to 162 for Barcelona. Air pollution is but one of the economic and social costs of unstructured urbanization, which also contributes to the failure to meet basic infrastructure needs, traffic congestion and crashes, and the unsustainable cycle of rising energy demand. Targeting urban challenges like air quality and traffic congestion can open up opportunities for substantive climate actions as well as economic benefits. For example, EMBARQ research on the socioeconomic impacts of bus rapid transit (BRT) systems found that air quality improvements resulting from Mexico City’s Metrobús Line 3 alone are poised to eliminate more than 2,000 days of lost work due to illness, four new cases of chronic bronchitis, and two deaths on average per year, saving the city an estimated US$ 4.5 million. At the global level, 11 registered BRT projects in Mexico, Colombia, China, India, and South Africa are forecast to reduce emissions by 31.4 million tons of CO2 equivalent over 20 years. That amount equals the annual greenhouse gas emissions from more than 6.5 million cars. Economy-climate synergy also applies to water and land pollution, specifically that arising from cities’ wastewater disposal and solid waste management. Waste management emits 5% of global greenhouse gases and 12% of methane. One study in Brazil estimates that scaling up more sustainable waste management practices – such as small-scale, integrated projects – to cities across the country would reduce CO2 emissions by between 158 and 315 tons and avoid at least 2,500 premature deaths from air pollution over 20 years. Meanwhile, it would create between 40,000 and 110,000 jobs, save 0.5 to 1.1% of Brazil’s electricity demand, and increase the country’s GDP by anywhere from $13.3 to $35.2 billion between 2012 and 2032. Emerging cities – the mid-size cities of today and megacities of the future – will shape the global economic and environmental outlook, as they are the largest sources of economic productivity and emissions. In fact, a group of 291 rapidly expanding, mid-sized cities in emerging economies will account for more than one-quarter of global income growth and more than one-third of energy-related emissions growth in the next two decades. Given the rapid onset of urbanization and the long-lived nature of urban infrastructure, it is essential that mayors, city planners, and other leaders take the opportunity to act now. The decisions they make today can drive economic growth and curb climate change, or perpetuate the unstructured urbanization that dominated the 20th century. To learn more, read the full report, Better Growth, Better Climate, or watch the September 16th launch event.